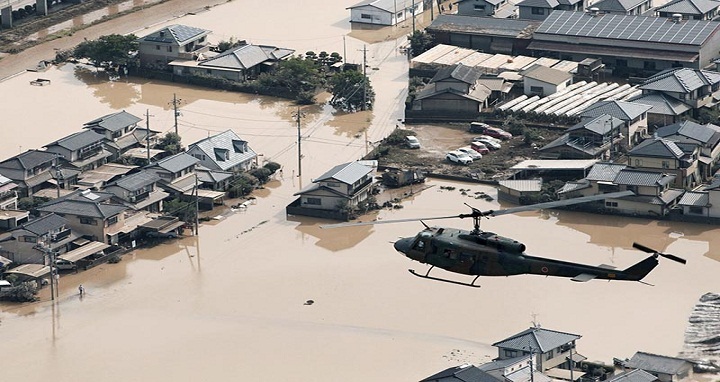 Dhaka, 9 July, Abnews: The death toll from record rains that have devastated parts of Japan rose on Monday (Jul 9) to 100, as rescue workers and troops struggled in the mud and water to save lives. The government's top spokesman Yoshihide Suga said 87 people had been confirmed dead, with another 13 found with no vital signs. He said more than a dozen people are still missing after days of torrential rains that have caused flash floods and landslides. Prime Minister Shinzo Abe has warned of a "race against time" to rescue flood victims, some of whom have resorted to tweeting desperate messages seeking help from emergency services. More than 2 million people have been told to evacuate, but the orders are not mandatory and many remained at home, becoming trapped by rapidly rising water or sudden landslides. But it also cautioned residents that even where downpours were over, the heavy rains had loosened earth - meaning the risk of landslides remained high. "The area became an ocean," said 82-year-old Nobue Kakumoto, a long-time resident. "I'm worried because I have no idea how long it will stay like this." "I've lived here for 40 years ... I've never seen this before," the 69-year-old oyster farmer told AFP. More than 50,000 rescue workers, police and military personnel have been mobilised to respond to the disaster, which has left entire villages submerged by flooding and left just the top of traffic lights visible above the rising waters.